Today, we’re proud to launch pre-orders for the next incarnation of the classic game of pulp action and Lovecraftian horror: Arkham Horror Third Edition. Whether you’re a veteran investigator or this is your first trip to the streets of Arkham, you’ll enter an exciting world of danger and eldritch mystery threatened by ancient beings from beyond space and time that defy all imagining. This world is full of ancient tomes, filled with forbidden knowledge. Now, we’re happy to announce another volume that can deepen your understanding of the arcane world of Arkham: the Arkham Horror Third Edition Deluxe Rulebook, a special pre-order promo item for Arkham Horror Third Edition! As of 10/23, the Arkham Horror Third Edition Deluxe Rulebook is officially sold out! However, you can still pre-order Arkham Horror Third Edition here! 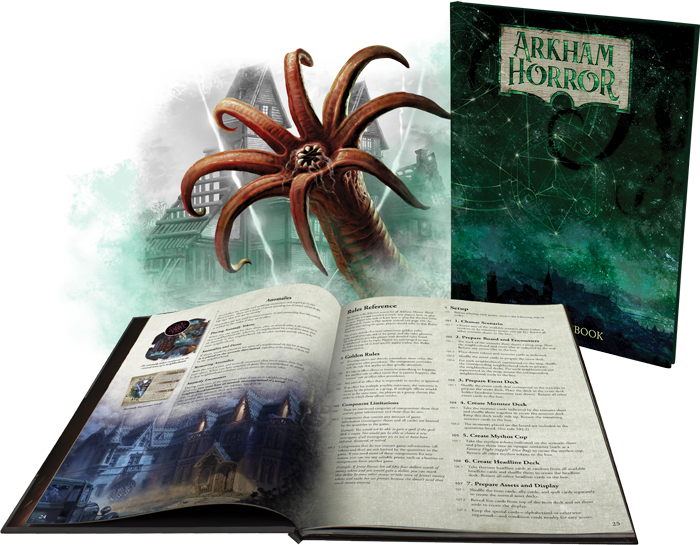 If you’re interested in receiving one of these Arkham Horror Third Edition Deluxe Rulebooks, there are two easy ways for you to get your copy while supplies last! You can pre-order Arkham Horror Third Edition on our website—everyone who pre-orders at least one copy of Arkham Horror Third Edition on the Fantasy Flight Games website will receive a copy of the Deluxe Rulebook for free with their order! Alternatively, you can talk to your local retailer about getting an Arkham Horror Third Edition Deluxe Rulebook with your pre-order. Retailers should reach out to their distributors for more information about the Arkham Horror Third Edition Deluxe Rulebook. Pre-order your copy of Arkham Horror Third Edition (AHB01) at your local retailer or online through our website today. As of 12 p.m. CST on 10/23, the Arkham Horror Third Edition Deluxe Rulebook is officially sold out!